There are countless hashtag-worthy cliches and platitudes to keep a person motivated on tough days. But how often do we manage to keep that attitude when things go pear-shaped? Danielle Lancelot Watson has been living her motto--"No excuses and no regrets"-- to the full sense of its meaning. After receiving her master's degree in Occupational Therapy, Danielle found a job working alongside individuals with hand and arm disorders, helping them recover from trauma or disease and developing the necessary skills to maintain a healthy life. For Danielle, regrets and excuses don't make life easier. Nor do they fix any problems. Danielle encourages those around her to ban the words "I can't" from their repertoire, as there mere utterance drastically reduces the chances of success. Danielle believes that if you don't like something about your life, there is usually a way to change it. With her ability to empathize with her clients, Danielle establishes a camaraderie that helps build her clients up, rather than bring them down. Once during a session, an Iraq war veteran told her, “Us gimps have to stick together.” Danielle was honored. When Danielle was 28, she was a seasoned climbing enthusiast and a passionate outdoor athlete. It was on a climbing trip on June 4, 2011, near Gunnison, Colorado, where Danielle's life went pear-shaped. While climbing, Danielle's rope slipped through the harness, dropping her to the valley floor, breaking her ankles, femur, pelvis and back, in two places. Danielle fell 280 feet, the longest survived fall on record. She woke up in a hospital a week later. Doctors attribute her survival to the fact that she landed on her feet. However, the fall paralyzed her at T6. She now uses a wheelchair for mobility. After her fall, Danielle experienced profound changes in both her physical and mental life. But she bounced back from her injury, and has become an accomplished athlete, inspiring not only her peers but her patients as well, because of it. Little is known in the mainstream athletic culture about adaptive lifestyles and adaptive sports for gritty athletes like Danielle. She herself mentions not ever really knowing anyone who was in a wheelchair before her accident. "It has taken me years to realize the subtle prejudices I held against disabled people from my 28 years of being an able-bodied person," she says. "The key, I have learned, is to not dwell on the loss, but to focus on the positive thoughts that serve you better. . . I made a decision, and my life went in this direction. This is life." The restrictions of a wheelchair for an athlete like Danielle took some getting used to, to say the least. But now Danielle sees her mobility devices as tools that give her freedom and independence. Only six months after her accident, she first skied with a dual ski, equipped with two skis under a chair, and then a mono-ski. In the beginning, she "had to focus on small triumphs, like linking 2 turns together before falling over!" but now Danielle uses an adaptive sit-ski regularly. In 2009, Danielle completed what is probably the first sit-ski descent of Tumalo Mountain in Bend, Oregon. Tumalo Mountain was formed by Ice Age glaciers that carved a cirque into its northeast flank, producing a bowl shape that is popular for skiing. In 2016, Danielle competed in the Bike MS Deception Pass Classic, a two day bike tour on a hand-cycle, which looks like a recumbent bike but is powered through one's upper body. Traditional hand-cycles haveone wheel in the front and two in the back. Off-road hand-cycles have two wheels in front and one in back, which gives the ability to tackle steep slopes while maintaining a lower gear ratio range. Danielle went on to compete on her hand-cycle in the Tacoma City Marathon (2016); the Vancover BC Rock and Roll Half Marathon (2016); the Bike MS Willamette Valley two day bike tour (2014); the Tour des Chutes, a twenty-five mile bike tour (2014); the Smith Rock Ascent Half Marathon (2014); Portland's Rock 'n' Roll Half Marathon (2014); Bend's Pole Pedal Paddle Race (2012 and 2013); the Deschutes Dash; Sprint Triathlon (2013); Bend's Smith Rock Half Marathon (2012 and 2013); and Oregon's Sunriver Marathon (2012). The list continues and exhausts the minds of even the most inspired athletes. Despite these major accomplishments, it's not just the races and competitions that fuel Danielle but the exhilaration of a new challenge. "I love dreaming something up, making plans to do it, and then executing it. I am happiest when I have a project in the pipeline," she says. 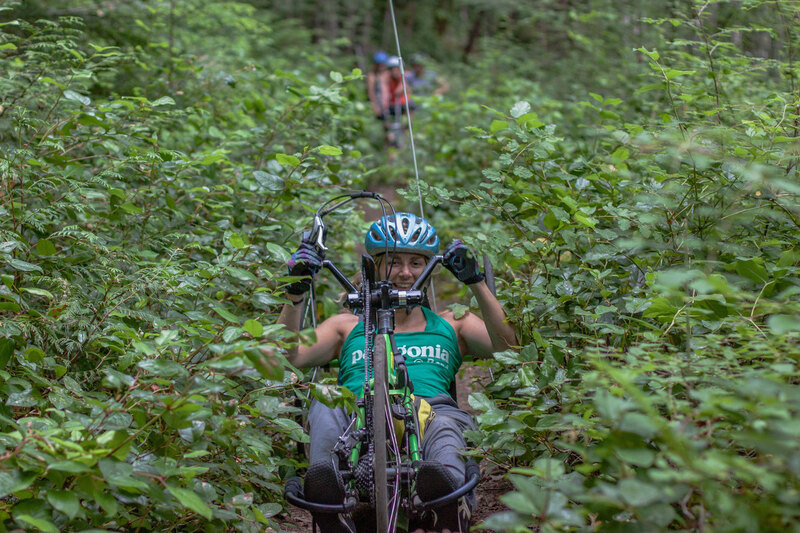 In 2014, Danielle took her hand-cycle, a recumbent bike, for four days and 120 miles through the Olympic Peninsula in the state of Washington, a sub-alpine temperate rainforest known for its stunning vistas and pacific coastline. Danielle also went on a sit-skiing trip in Chile in 2015 with other adaptive athletes. 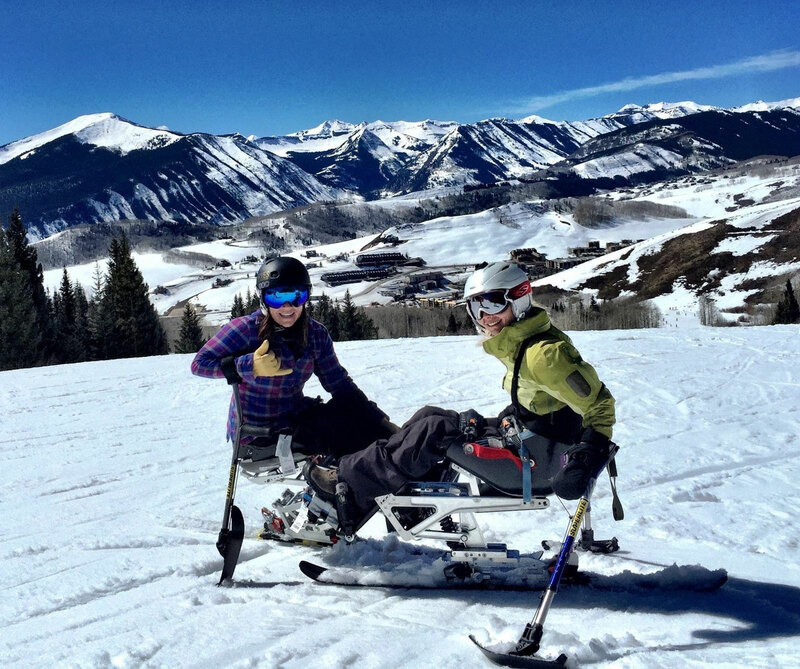 This trip was organized by Telluride Adaptive Sports. After graduating with her Master's Degree in Occupational Therapy in May 2016, Danielle took a road trip to Moab, Utah to visit friends and participate in Moab Mania, an off-road hand-cycling trip organized by Telluride Adaptive Sports. On this trip, she also visited Wupatki National Monument in Arizona where she and a friend biked 20 miles downhill through pine trees to the open plains, all under a full moon. That night, they camped out in the van, which, Danielle says, "warmed my heart because of course I like that kind of stuff." Even ahead, there are more adventures to come: "It is currently my dream to mountain bike the White Rim in Canyonlands National Park, Utah . . This was a dream of mine before my accident and I know it is still possible. It is a hundred mile trail that will probably take me about a week. Besides being an awesome experience in itself, it means a lot to me being so close to the red rocks of Moab, Utah, where I once spent a lot of time climbing." Perhaps Danielle's powerful approach to occupational therapy is derived from the motivation and tough love she received in her own life she realized that she’s able to, in her own words, “accomplish so much more while surrounded by those who expect nothing less than awesomeness from me." No doubt this is the same standard she applies to her patients now. Despite her busy new career, Danielle took the time to speak openly about her life, her accident and how she found a more inspired version of herself in a dark time. Danielle in Moab, Utah in 2015 on an off-road hand cycling trip with Telluride Adaptive Sports. M: What do you most like about occupational therapy? I am really excited about occupational therapy because it is a very holistic health profession. I will be helping people get back to what they need or want to do after an illness or injury. The word "occupation" in this sense can be anything you do. I think it's important to look at the whole person instead of just treating a diagnosis. I just accepted my first OT position as a hand therapist! I am drawn to this specialty because our hands are so involved in everything we do, even our communication, and are such beautifully complex machines. How has your experience impacted your career as an occupational therapist? If you could go back and tell your hospitalized self one thing on the day you first woke in the hospital post-accident, what would it be? I wouldn’t change a thing about that time in my life. I studied philosophy in undergrad (which doesn’t pay the bills) but I do believe it prepared me for that moment waking up in the hospital. I realized quickly that I could wallow in self-pity or choose to make the best of my situation. Because of my spirituality, I had a practice in positive thinking that I was able to use after the accident and throughout my rehab. The key is to have gratitude, especially for the smallest things in life, like the sun on your face or your dog being silly. Tell me about the woman who visited you in the hospital and told you about life in a wheelchair. What did she tell you that has stuck with you? The most amazing thing to me at that time about her was that she was an active woman with a career and a child. When I was injured, I initially thought that I would never get married or work again. It has taken me years to realize the subtle prejudices I held against disabled people from my 28 years of being an able-bodied person. To be crudely frank, your accident is many athlete's worst nightmare. How would you respond to an athlete who tells you this? I know people have this perspective, and I am sure I felt like this before my injury. I never knew anyone with a disability and to be honest they were invisible to me. I would respond that I do not regret what happened because I feel like my experience of this life has gotten so much deeper and more meaningful since my injury. The adaptive athletes and/or people living with various disabilities that I have met are so much stronger and their achievements are so much greater than I could have imagined. I have met such quality people who are involved in adaptive sports, and have made lifelong friends with loving people who are willing to slow down a bit and make the extra effort to help me get outdoors. If I could erase this whole experience and go back to being an able-bodied person but with the level of awareness I once had, I wouldn’t do it. Did you think you were going to walk again? You have demonstrated that you are an incredible athlete. You have completed the first mono-ski of Tumalo Mountain in Bend, multiple hand-cycle events/races and marathons! What motivated you to do these projects? I love dreaming something up, making plans to do it, and then executing it. I am happiest when I have a project in the pipeline. The hardest part of my disability is handling my ego. I have to accept that I will never be the best at any athletic feat again. I say that without bitterness, it is just the truth of having a high thoracic spinal cord injury. Instead, I try to be adventurous. I have a blast and I have gratitude that I am able to do the things that I do. I am grateful every time I get outside and breathe fresh air. I have learned to accept help from friends, family, and strangers to do the things I want to do. Not letting my wounded ego take over, and learning to accept help from others, are not challenges one just overcomes once and for all, but have to be dealt with every once in a while. I think this is true for the non-disabled as well! Can you describe the feeling you had on your first day on an adaptive ski? It is such an awesome feeling to be able to get out of my wheelchair and into a ski which allows me freedom to fly through the outdoors. I don’t like to see myself as limited but there are limitations on where you can go when you use a wheelchair. The world isn’t paved and equipment like sit-skis and handcycles allow people with disabilities to access the outdoors. The first 2 seasons on the adaptive ski were very hard, and I took a lot of hard knocks. But I most of the time I just appreciated the blessing of being able to get out into nature. I had to focus on small triumphs, like linking 2 turns together before falling over! How did you motivate yourself to become a stronger athlete after your accident? What motivates you now? I am motivated to push boundaries. Like when I was a climbing, I like to push myself a little further all the time. Over the past few years, I have come to see myself as a person with a disability and my motivation has changed a bit to be representative of the disability community. I want to show others what is possible and that being disabled doesn’t mean you are stuck in bed or at home. Your motto has been "No Excuses. No regrets." What does this mean to you? “No excuses” represents banishing the words “I can’t” from your vocabulary. If you utter these words, your chances of accomplishing the task at hand goes way down. I am often surprised by trying different things and finally doing something I didn’t think was possible. “No regrets” to me means that if you are happy in the present moment, you must accept everything, good and bad, that brought you to this moment. And if you are not currently happy, then you must make a change in your life. Can you name a consumable piece of media that you turn to for motivation? I watch stuff like the following to get pumped up. I encourage all readers to watch these two videos to witness the incredible world I am blessed to be a part of. I still get emotional when I watch them. Tell us about Oregon Adaptive Sports (OAS). How involved are you and what do you like about this organization? I truly credit Oregon Adaptive Sports for saving my life (of course after the surgeons did). I moved to Bend, Oregon after my accident without knowing anyone besides my family and a new body. OAS gave me a sense of purpose when I was at my lowest point and made sure I learned to sit-ski with dozens of donated lessons. I have met so many great people through OAS that have become lifetime friends. OAS attracts people that are so big-hearted that they are willing to spend their free time making sure that others can enjoy the outdoors. Does dating fit into your life now? Yes, I date. I want the public to understand that people with disabilities are still sexual beings and many have meaningful relationships and families. At the time of my accident, I was in a relationship, but my partner couldn’t handle the new situation and he left. This was an enormous blow to my confidence and I thought that I would never be loved in this life. This did not turn out to be true- I have had meaningful relationships with some great guys since my accident. There are challenging aspects of dating with a disability. Body image is a constant challenge. Having a spinal cord injury presents a dichotomy- on one hand I have everything together and lead a normal life, and on the other hand I have a lot of health issues to monitor and deal with daily. Finding a balance in the presentation of these issues is key. I have yet to find someone who is accepting of all of me but I am hopeful! How do you push back on the people that doubt your abilities before and after your accident? How did you push back, for instance, on those that doubted your ability to get your master's degree and work as an occupational therapist? A major theme of my life since my injury has been knowing when to push back and when to go with the flow and be open to where life is taking me. I wanted to become a physical therapist before my injury and spent 3 years after my accident trying to get into PT school. I was inspired by stories of people who didn’t give up on a dream and kept fighting until they persevered. However, I was rejected by 14 schools over 2 years because of my disability. So when the University of Puget Sound called me and asked if I would be open to applying to the occupational therapy program, I said yes. The UPS occupational therapy program and the profession in general sees my disability as a strength instead of a weakness, as it should be. Who better to work with people with disabilities than someone who has had that experience themselves? I believe everything worked out the way it was supposed to and I am so grateful to be part of such a holistic, inclusive profession. What are the three qualities you think are necessary to living a full and happy life? I think the only quality necessary is gratitude. 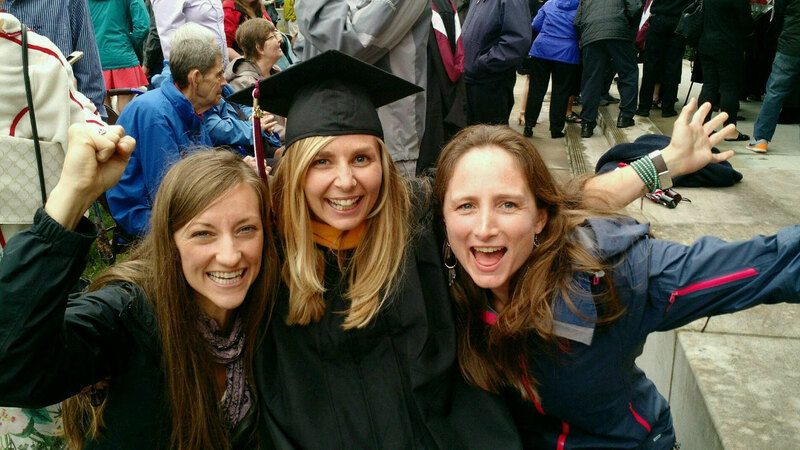 Master's Degree Graduation photo from May 2016 with Danielle (center) and two best friends.